Sara Kayser and I must have exchanged more than 20 emails and a bunch of likes on Instagram and now she feels like an old friend. She has been generous enough to share her recipe for a Mexican-style lasagna that’s sure to feed friends and family. She blogs at theravenoushousewife.com, a blog that focuses on family-style and budget-friendly recipes. She’s partial to cooking pasta and baking cookies and is into all things food, bike riding, and trashy reality TV. Have you ever successfully made authentic enchiladas? I’ve tried it before, and my tortillas always ended up breaking. I tried to prevent it by rolling them ahead of time and storing them with a damp paper towel, but that didn’t work. I even tried laying a few tortillas flat on top of the enchiladas before adding the sauce because I didn’t like the idea of pouring sauce directly on the filling. But even that did not keep the corn tortillas from breaking? The key, I learnt, is to fry the tortillas, soak them in the sauce before adding the filling. But that to me is just too much work. Instead of taking that route, I came up with 2 alternatives. The first is to make them with flour tortillas, an ‘enchirito,’ if you will. I’ve made them a few times like this, and I actually love the chewiness of the flour tortilla. The only downside is they cannot be assembled ahead of time because they get too soggy. The second way is this is to make a Mexican lasagna with the tortillas with lots of veggies. With caramelized onions. And sautéed mushrooms. And sautéed spinach. Yum, right? And so much easier than frying, soaking, and rolling. Instead of rolling the corn tortillas, just use them as lasagna sheets, and go ahead and use some Mexican flavors. You can always make this with chicken or beef, but I thought it’d be fun to lighten it up a little and do an all-veggie version. For the caramelized onions, it’s all about patience. You can use caramelized onions to top burgers or grilled meat (especially in summer!). Since it takes a while –almost an hour-, you may as well make a bunch at once if you can use them. This lasagna only uses one onion, but you can definitely make a big batch and save some for later or even omit the mushrooms and spinach and use all caramelized onions! Since this is so veggie-ful, I don’t feel like I need to do a big side dish with this. I think the best side is some crunchy shredded iceberg lettuce with fresh diced tomatoes and a little sour cream or Greek yogurt to cool it down. This is also a great make-ahead meal, which of course I love. You can assemble the whole thing up to 3 days in advance! If you do it this way, just remember to add about 10 minutes to the initial covered cooking time to take the chill off. Add a few tablespoons of oil to large pot or Dutch oven over medium heat. Once the oil is hot, add the sliced onion. Saute on low to medium for about one hour. Stir every 5 minutes or so. After 10 minutes, add the sugar and salt to help draw out the water and help caramelization. Add a little more oil gradually during the process, if necessary. After the onions have caramelized, remove them with a slotted spoon, and set aside. Clean the mushrooms with a dry paper towel. Use the towel to gently scrub off any dirt. Slice thinly. If necessary, add a little more oil to the pot. Let the oil heat up for another minute or 2, add the sliced mushrooms, and sauté until lightly browned, about 6-8 minutes. Remove the mushrooms with a slotted spoon, and set aside. Add a little more oil if necessary and add the spinach and granulated garlic. Sauté the spinach, stirring frequently for about 2-4 minutes. Add the enchilada sauce to the pot. Add the onion and mushroom back to the pot. Bring the sauce up to a boil on medium high heat, and cook for 2-3 minutes, stirring frequently. Turn to low, and cook the sauce for another 2-3 minutes. Remove the sauce from the heat, and set aside. 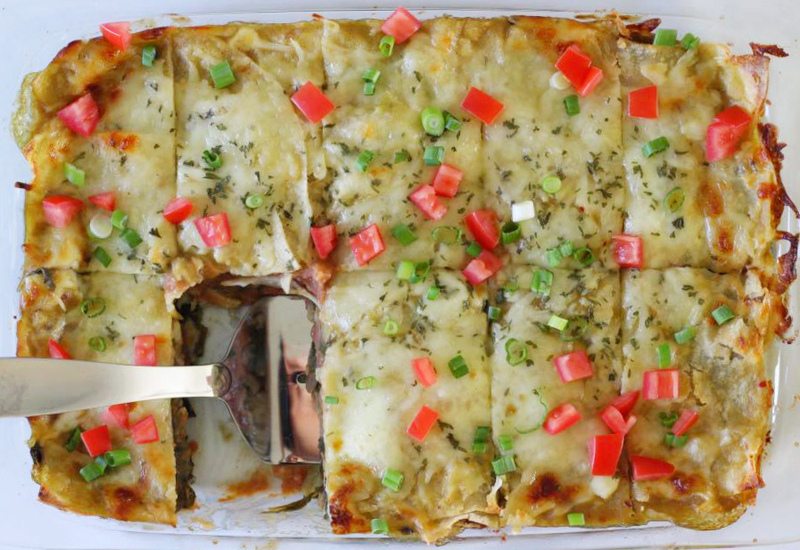 To create lasagna sheets from the enchiladas, cut each one in half. Cover the sauce layer with a layer of corn tortillas (each layer uses 4-5 small tortillas). You can overlap a little if you need to, but make sure the sauce layer is covered with the layer of tortillas. After the tortilla layer, spread a layer of refried beans. If the beans are hard to spread, heat them up in the microwave at 30 second intervals until soft. Sprinkle about 1/3 of the cheese on top. Repeat the layers in the same order until you run out of beans. You should have 2-3 layers of each. Follow up with one last layer of tortillas, then enchilada sauce, followed by cheese. Sprinkle with a little dried parsley. Cover with aluminum foil, and bake at 175 degrees C for 35 minutes. Turn the oven up to 200 degrees C, and uncover the lasagna. Bake for a further 20-25 minutes, or until the top is brown and bubbly. Remove from the oven and allow the lasagna to settle for 20-30 minutes before serving. Meanwhile, thinly slice the scallions. Remove the seeds from the Roma tomatoes, and cut the tomato into a small dice. Garnish the lasagna with the sliced scallions, Roma tomatoes, and sour cream. Serve hot. Such a light, easy and delicious dish! Can’t wait to try it!